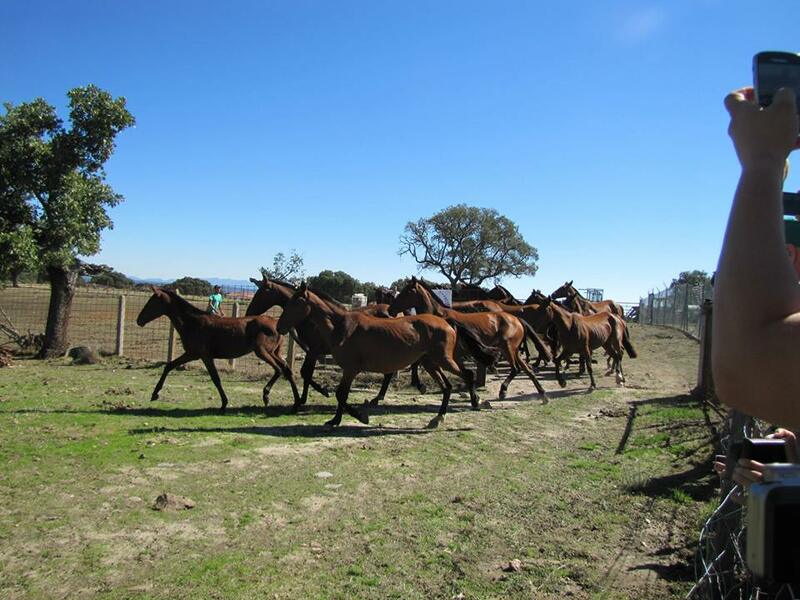 23 Retuertas horses, coming from the Doñana biological station in southern Spain, were released in the Campanarios de Azaba biological reserve on October 7. The release was possible thanks to Fundación Naturaleza y Hombre in Spain, land owner of the reserve, with support from Rewilding Europe. “Our objective is to have two herds at two two different locations – this new one in Campanarios as a complementary to the one in Doñana, to ensure a more effective survival of this breed, the most ancient in Iberia,” says Carlos Sanchez, Director of Foundation Nature and Man (FNYH) that manages the site. Staffan Widstrand, Marketing and Communication Director of Rewilding Europe pointed out the importance of the Retuertas horses for the continued rewilding of the area. About 60 delegates from WILD 10, the World Wilderness Congress in Salamanca witnessed the release and spent the full day in the reserve, seeing also hundreds of griffon vultures, black kites and red kites, but also some black vultures and short-toed eagles. This is the second herd released in the reserve, one of the sites in the “Rewilding 10” of Europe. The population of the Retuertas horses in the Campanarios de Azaba Reserve has thereby now doubled. In July 2012, 24 Retuertas horses were released there and currently, in total 47 wild horses are free roaming in the area. This latest release will strengthen the nucleus of retuertas that already exist in Campanarios of Azaba, guaranteeing the survival of the breed in Doñana, in case there would be any disease outbreak or similar. And in addition, it will allow the process of incorporation of large herbivores in this reserve in the Salamanca district. As the first herd, also the second Retuerta group in Campanarios will be treated as completely wild living animals, and live in natural, social groups, grazing the reserve which is currently 500 hectares. The Campanarios de Azaba biological reserve, located in the Espeja municipality in the region of Ciudad Rodrigo consists of typical Dehesa savannah woodland with different oak habitats (Quercus ilex, Quercus pyrenaica) and has been declared one of the most biodiverse areas in all of Europe. Rewilding Europe intends to contribute to the increase of and the protection of the biodiversity in Western Iberia by reintroducing natural grazing as a key ecological process. In order to reach its goals in Western Iberia, the initiative has started to work in two pilot areas: Campanarios de Azaba reserve (Spain) and reserve (Portugal). The reintroduction of wild living herbivores will not only support the recovery of natural spaces and increase biodiversity; it will also provide new opportunities for local communities, landowners and stakeholders in the area. This horse breed got its name from the so-called Retuertas, flooded areas inside the Doñana National Park, where the sands slowly drain water towards the salt marsh. They work as natural drinking places for the animals. There is only a small number of Retuerta horses with ancestral genes left: in total around 150 animals in 2012. The Retuertas breed was originally used for agriculture work but other breeds that are more suitable for these purposes replaced them. This in turn led to near extinction of the Retuertas horse, with only half a dozen animals left in the 1980s. After rigorous comparative genetic analysis with other ancient races like Asturcón, Losino and Potoca, a study published in 2006 has discovered that Retuertas are one of the oldest horse breeds in Europe.